When Jane Austen started writing novels, as a teenager in the late 1700s, the ascendant trend was gothic fiction: dark doomy stories about ghouls and haunted old castles in a post-Enlightenment world gone crazy. (Seven years after Austen published her first novel, in 1811, Mary Shelley debuted with Frankenstein.) Austen’s art was aggressively anti-gothic: domestic, feminine (she published anonymously, under the byline “A Lady”), and scrupulously realistic. Her devotion to raw everydayness, unenhanced by the eighteenth century’s well-stocked arsenal of narrative special effects (melodrama, sensationalism), made these quiet little works, paradoxically, more shocking than a whole library of blood-and-thunder books. And yet every Austen novel is, in its own subtle way, also a kind of horror story. As the characters navigate their circuit of dinners and balls and countryside strolls—as they suffer visits from gossipy aunts and shallow rivals and tedious suitors— a cluster of doom always hangs low and heavy on the horizon. Her plots are soaked in dainty menace: boredom, embarrassment, financial ruin, romantic betrayal, spinsterhood. A formal tea, in Austen’s world, is a Texas Chainsaw Massacre of aristocratic Regency manners. Now we have a sequel: Sense and Sensibility and Sea Monsters, which transposes the story of the dyadic Dashwood sisters—levelheaded Elinor (sense), impulsive Marianne (sensibility)—from a country cottage in Devonshire to a “tiny, wind-rattled shack” on desolate Pestilent Isle. Once again, Austen’s tidy story is embroidered with B-movie staples: giant man-eating jellyfish, sharks, lobsters, and sea serpents. Much of the fun, of course, comes from comparing it with the original. 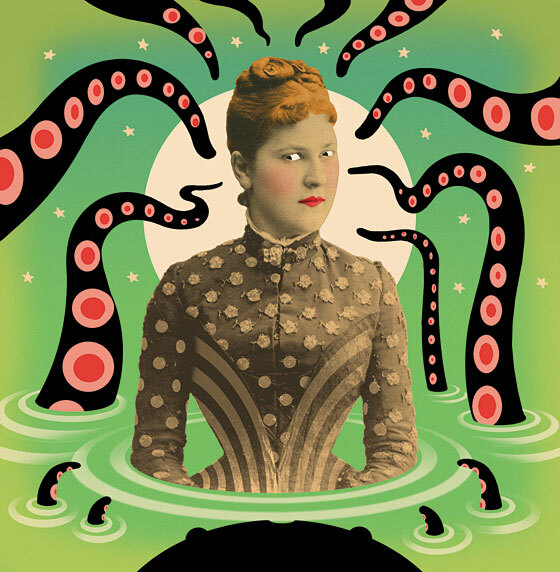 Instead of spraining her ankle running from a rainstorm, Marianne falls face-first into a brook and gets attacked by a giant octopus. (The dashing Willoughby arrives in his wetsuit and spears it.) As in Austen, Colonel Brandon is unattractive to Marianne because he’s old and reserved; here, thanks to a sea witch’s curse, he also has tentacles growing out of his face. (Instead of “colouring a little” when he’s piqued, his appendages start “fluttering wetly with embarrassment.”) Eligible mates are assessed not only by income and lineage but also by lung capacity and the ability to elegantly ride a porpoise. It’s hard to say, in the end, if this is an homage, an exploitation, a deconstruction, or just a 300-page parlor trick. Although the sea-monster subplots, considered independently, rarely rise above pulp clichés, the book’s best moments do achieve a kind of bizarro symbiosis. The monsters make Austen’s abstract threats ridiculously concrete (Elinor is nearly killed by the notorious Devonshire Fang-Beast at the same moment she learns that her love is secretly engaged to someone else), and Austen, in turn, dignifies the monsters: They serve as gargoyles emphasizing the immaculate balance of her original story’s structure. By Jane Austen and Ben H. Winters.